CarGurus has 392 nationwide R8 listings starting at $48,523. Named after the wildly successful Le Mans racer, Audi’s all-wheel-drive (AWD) midengine R8 sports car made its debut in 2008. First powered by a 4.2-liter V8, the R8 range soon came to include a V10-powered version, and an R8 Spyder arrived in 2010. The much-anticipated second generation of Audi’s 2-seater arrives for 2017, and it will utilize the company’s Modular Sportscar System (MSS), the same platform that sits under the Lamborghini Huracán. The MSS is a largely aluminum spaceframe that incorporates fiber in a few key places, contributing to an overall weight loss of 110 lbs over the previous model, as well as an overall 40% improvement in torsional stiffness. Although the new R8 is 1.6 inches higher and sports a flatter, wider grille, its overall styling is very similar to the first generation. A V8 model may arrive at some point, but for now the 2017 R8 is offered only in the V10 and V10 Plus trims, and will compete primarily with cars like the Porsche 911 Turbo and McLaren 650S. Prices should start somewhere in the neighborhood of $165,000. Both the R8 V10 and R8 V10 Plus will come with the 5.2-liter V10 that powered the first generation R8, producing 540 hp in the base R8 and 610 hp in the V10 Plus. It should do 0-60 mph in 3.5 seconds with a top speed just shy of 200 mph for the base trim, and 3.0 seconds with a top speed of about 205 mph for the Plus. Official fuel economy figures have yet to be released, but Audi is claiming a 13% improvement over the previous generation. This comes in part thanks to a new cylinder deactivation system, which allows the R8 to run on only five cylinders during relaxed, low-speed situations. While this is an admirable step, any car with ten cylinders is a thirsty motor. The last R8 V10 managed just 13 mpg city/22 highway, so don’t expect to be away from the gas pump for long. One other significant change for 2017 (and a disappointing one for many drivers) is the absence of a proper manual gearbox. The old R8 was available with a 6-speed that featured a beautiful open gate shifter, but the new car is available only with Audi’s S Tronic dual-clutch gearbox. The AWD R8 rides on 19-inch wheels, with 20-inch wheels optional, and its driving dynamics can be tweaked using a driving mode selector that includes Comfort, Auto, Dynamic, and Performance modes. Comfort and Auto modes would naturally be used for regular, everyday driving, while Dynamic and Performance modes would be reserved for more spirited driving or time on the track--Performance mode shuts off the traction control altogether. The R8 features magnetic ride damper control, and the optional dynamic steering with variable assist and variable ratios will be useful for people who drive their R8 a little more seriously. In addition to the big bump in power you get with the R8 V10 Plus, there's a corresponding large bump in braking performance thanks to the big carbon ceramic brakes (15 inches up front and 14 inches in the rear). The base trim's magnetic ride dampers get more focused shocks and steel springs. While the R8 is primarily engineered and styled as a performance car, Audi is a luxury brand, and the R8's interior gets a luxury treatment. The seats are upholstered in either nappa leather or leather/alcantara, and the V10 Plus includes more supportive buckets. The seats on both trims are heated, power-adjustable, and feature contrast stitching. The cabin also features LED interior lighting and Audi’s MMI Plus infotainment system. One new feature is the “virtual cockpit”, which allows the driver to move the information screen from the center stack to a configurable 12.3-inch display embedded in the large instrument panel. This display can be controlled with either a dial on the center console or a group of buttons near the steering wheel. A Bang & Olufsen sound system is also optional. But despite the luxury look and quality finish of the R8’s interior, it can’t hide the fact that it's part of a midengined sports car. This means there's not much more cargo space than a front trunk that’s big enough for about a week’s worth of groceries. The R8 may be one of those supercars you can pull off as an everyday driver, but unless you’re single it’s probably a good idea to have another automobile in the driveway. The 2017 R8 hasn’t undergone any major crash testing, but its safety features include a pair of side thorax airbags and another pair of roof-mounted airbags for head protection, as well as a rear-view camera and parking sensors. The second-generation R8 isn’t a big breakthrough or a major departure from the first generation, but it does keep the model competitive in the supercar market and offers a more laid-back alternative to the mechanically similar Huracán offered by Audi’s subsidiary Lamborghini. 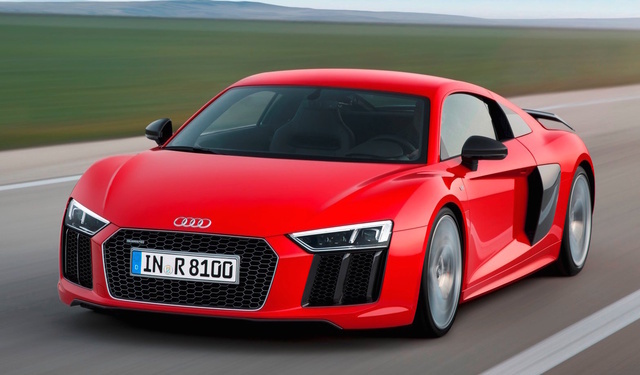 What's your take on the 2017 Audi R8? Users ranked 2017 Audi R8 against other cars which they drove/owned. Each ranking was based on 9 categories. Here is the summary of top rankings. 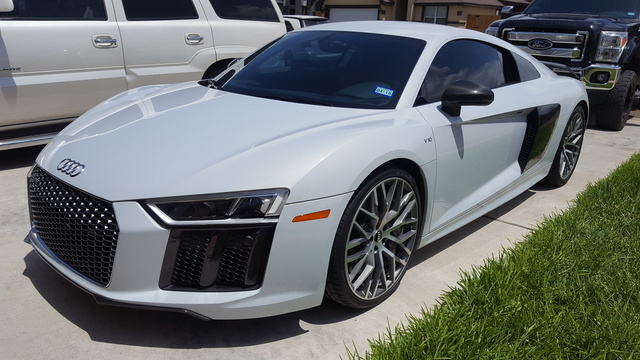 Have you driven a 2017 Audi R8?